A step backwards. The 13.3 inch E320 subnotebook presents itself to buyers with the strength of a standard CPU, a matte display, good input devices, and seven hours of mobile use. 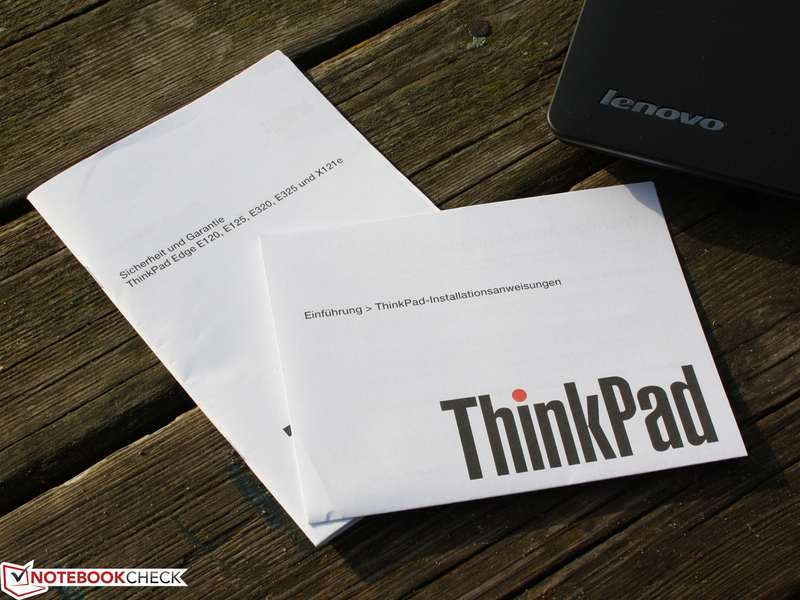 The usual ThinkPad robustness can however no longer be relied upon. 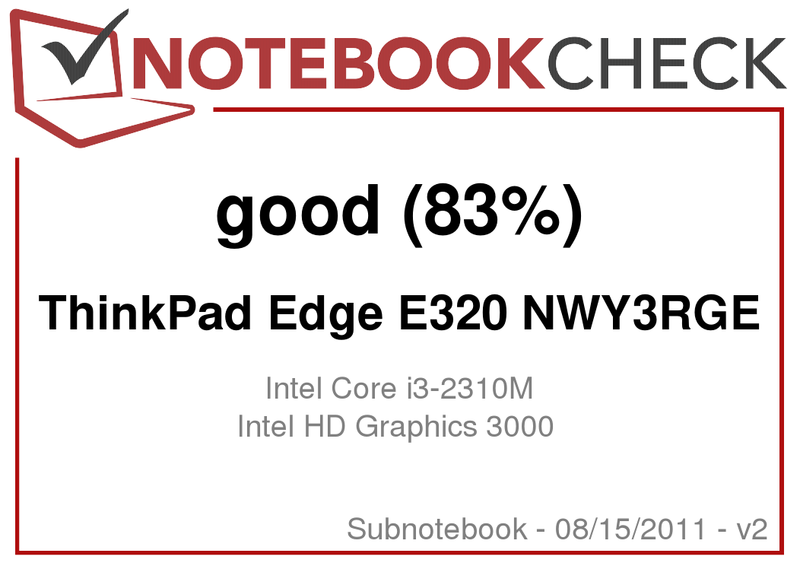 Numerous readers have been asking us questions over the past week regarding the review of the ThinkPad Edge E320 with a Core i3-2310M. 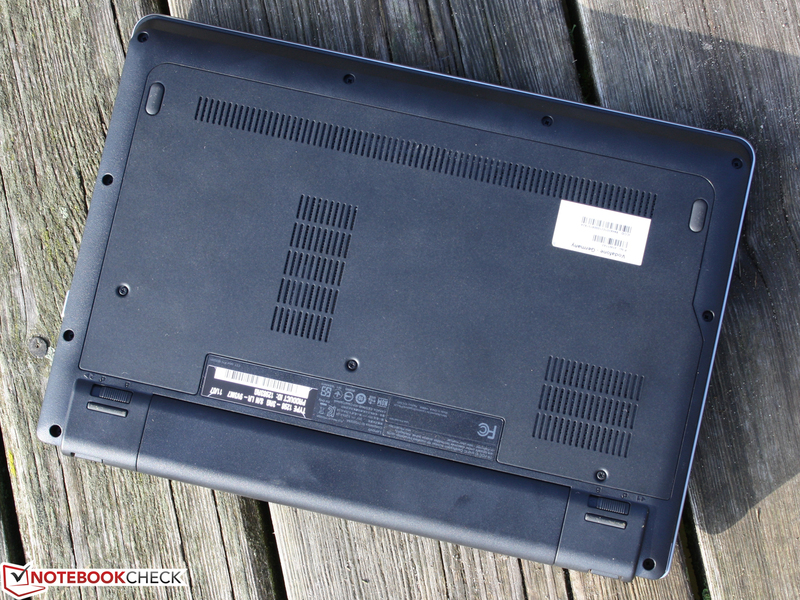 What makes the 13.3 inch subnotebook so attractive? The Intel platform promises a better performance than the AMD Fusion alternative E325. A non-reflective display combined with a relatively high battery capacity (63Wh) and a UMTS module, could make the perfect mobile companion. The current price of 740 Euros seems appropriate for the device. 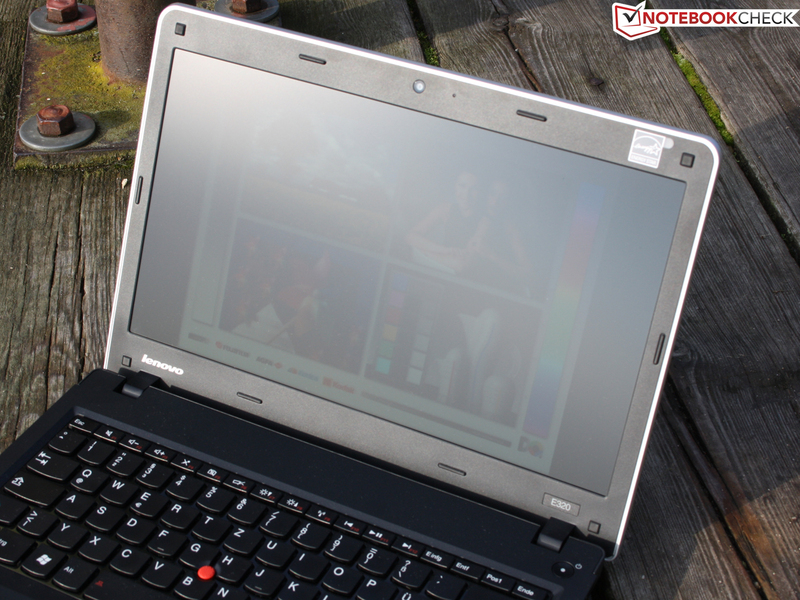 The Edge series from Lenovo in addition promises the classic qualities of a ThinkPad. Input devices suitable for working, a high level of case stability, and functional details have so far always been present in previous Edge reviews. The Edge E320 is however different. Why we haven't always been carried away by excitement can be discovered in our comprehensive review. The Edge E320 is the bigger brother of the Edge E125 (AMD Fusion), and the sister of the E325 (Fusion, currently in for review). 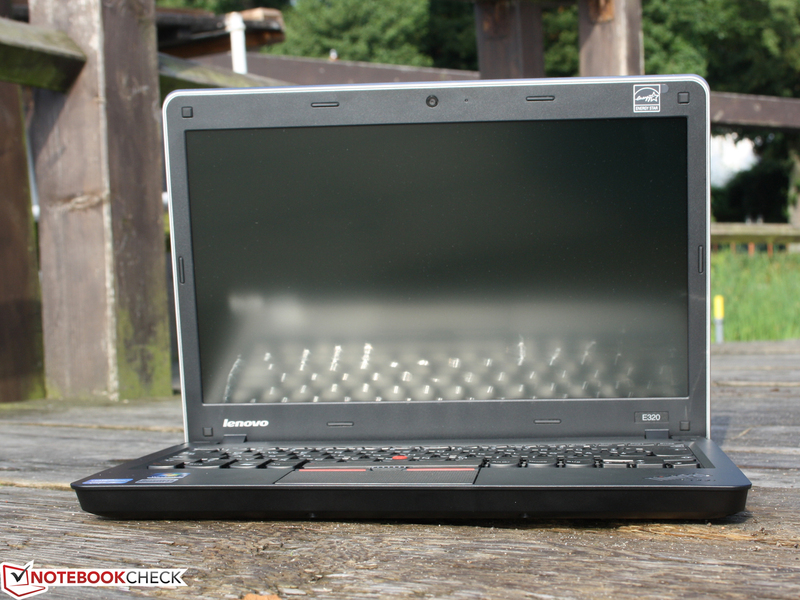 Lenovo also let's the ThinkPad X121e (currently in for review) nudge closer to the Edge devices, since the build and look of the chassis are very similar and almost identical (X121e / E125). The older models Edge 13 (Intel, AMD) in contrast had a different chassis. This was more stable and gave a more durable impression. 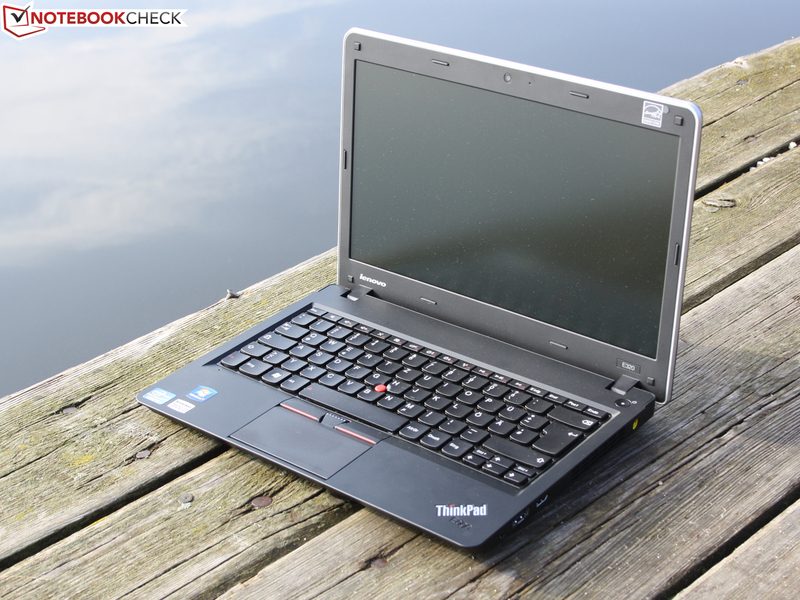 The reviewed E320, we unfortunately have to say, doesn't exceed the robustness of an average consumer subnotebook. What we didn't like are the softly attached display hinges (no longer completely metal), which let the display wobble. In addition to this the noticeably bendable chassis doesn't make a good impression either. In these respects the Edge 13 (K685) and the Edge 11 (Intel, AMD) with metal hinges and a rigid case were significantly better. A positive aspect in contrast is the feel. The display lid surface is rubbery and feels slightly like satin. Finger prints don't stand a chance on the decently glittery layer. The plastic inside surfaces are also grippy, but aren't rubbery. The chassis base plate consists of metal and can nowhere be dented in. Attempts to dent the surface also fail on the palm resting area, which lies solidly everywhere. The upper side of the lid could hardly be dented in over a larger area (with a flat hand). Only using a significant amount of force were we able to dent the surface in the middle using a finger to create changes on the display. 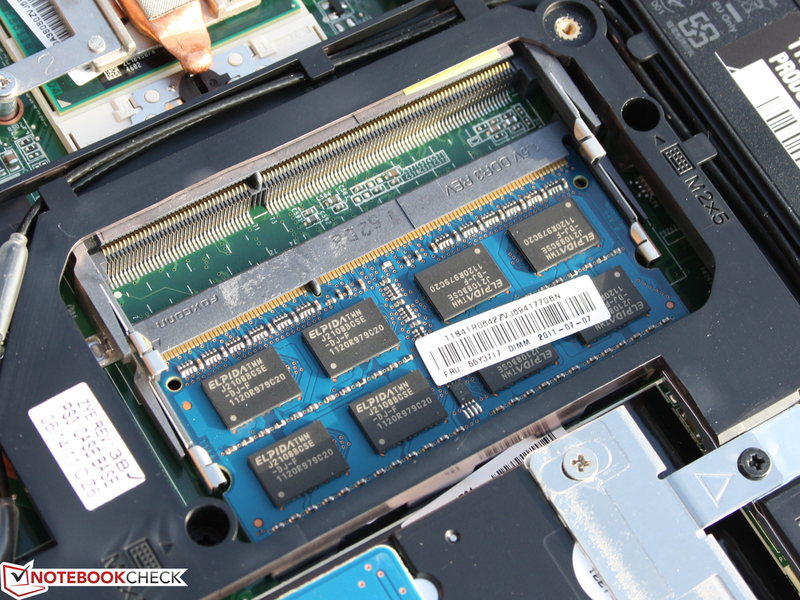 The E320 can easily be upgraded with RAM, or by swapping the hard drive for an SSD. The complete base plate can be removed for this purpose, by removing a mere three screws. 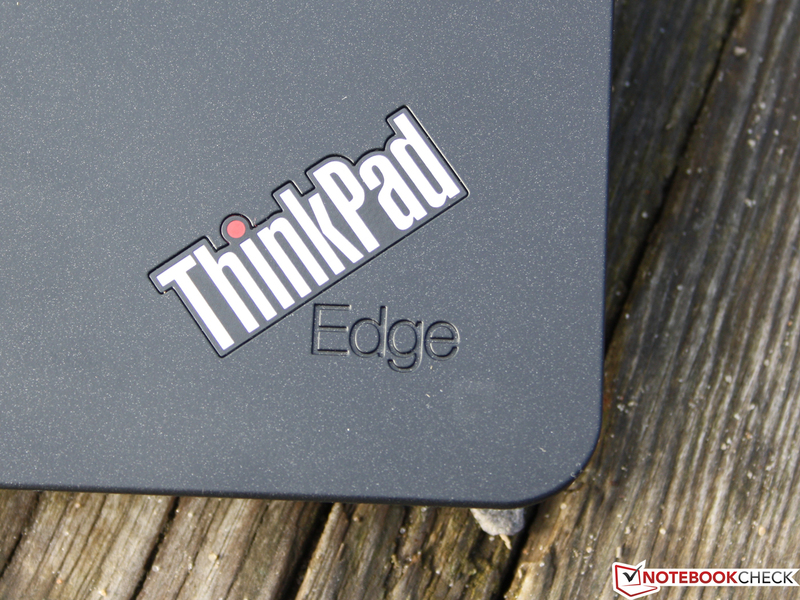 When it comes to the interfaces the ThinkPad Edge E320 is identical to its the predecessor Edge 13. Fast connections to external eSATA hard drives are possible, but not to already available USB 3.0 HDDs. 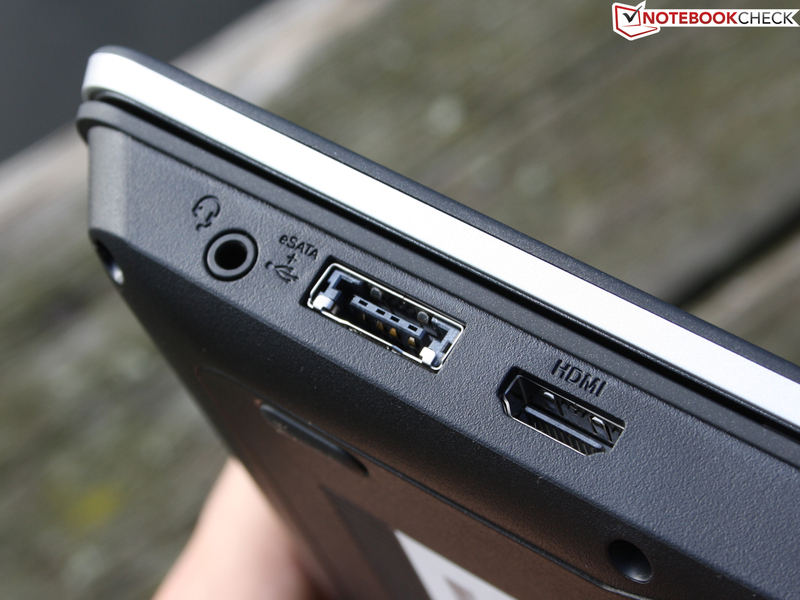 Upgrading of ports is not a possibility since there is no ExpressCard slot for the appropriate controller cards (e.g. for USB 3.0). Ports on the rear are useful for use on an office desk, since these leave space at the sides and also prevent the optical and practical nuisance of cables. In this case there could be a bulky eSATA cable lying in the way blocking the mouse pad for right handed users. 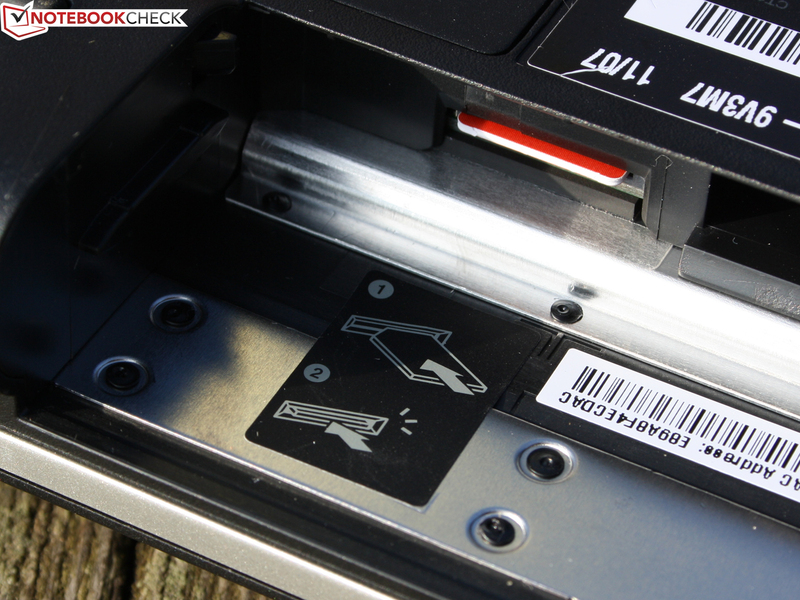 A docking station which could prevent this problem is not available for the Edge series. This is reserved for the high quality classic ThinkPads (without Edge, L- and T-series). 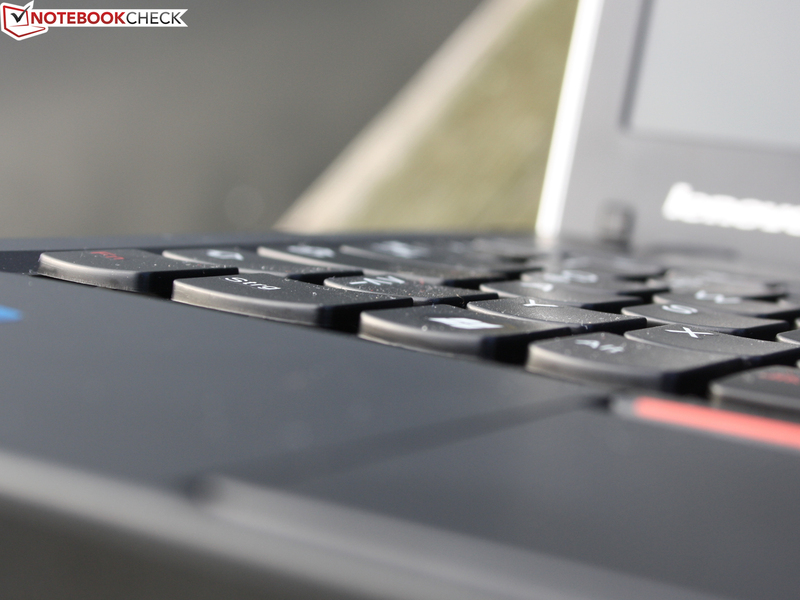 The E320 provides all the communications technologies that are currently possible in a subnotebook. First and foremost comes the Ericsson F5521GW HSPA module for mobile internet access. 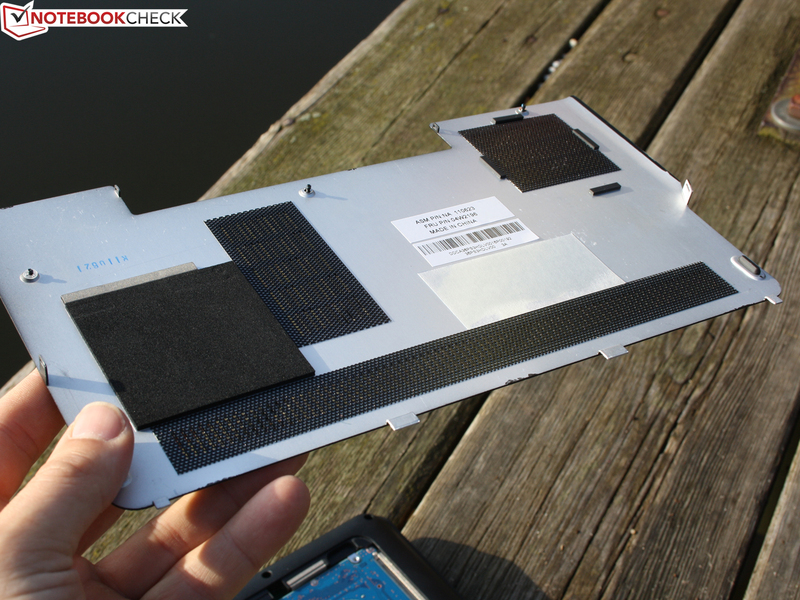 The SIM card has to be inserted under the battery. The WLAN module supports the Draft-N standard, and the Ethernet controller supports Gigabit Ethernet. Bluetooth 3.0+HS completes the package. For internet telephony and video chat, the Edge E320 is equipped with a Webcam with a resolution of 1280 x 720 pixels (widescreen). In the Communications Utility the microphone can be optimised for one or more voices (conference). A microphone mute button (upper row of keys) is also available. Business characteristics, such as a finger print reader, Computrace theft protection, and a marginally waterproof keyboard are not on board. At least there is an APS sensor (movement sensor for the hard drive, parks drive heads when shocked) and a Kensington Security Lock. The ThinkVantage-Tools incorporate the security, power, and system configuration. The data backup and restore features can also be accessed from this central tool. Recovery media are not included with the delivery. In this case users have to burn their own recovery DVDs (ThinkVantage restore). The accessories only include a warranty leaflet and a short user guide. The standard warranty for the Edge series lasts for 12 months. The ThinkPlus warranty extension increases this to 3 years. Depending on the service type this package costs about 55 Euros (Bring-In), or 85 Euros (on location). with detailed settings for performance. The keys provide a crisp pressure point and a clear key travel (approx. 4 millimeters). The smaller arrow keys don't stand out from the triangle of keys, which makes them appear squashed. Due to the low picture keys using these blind is not possible. 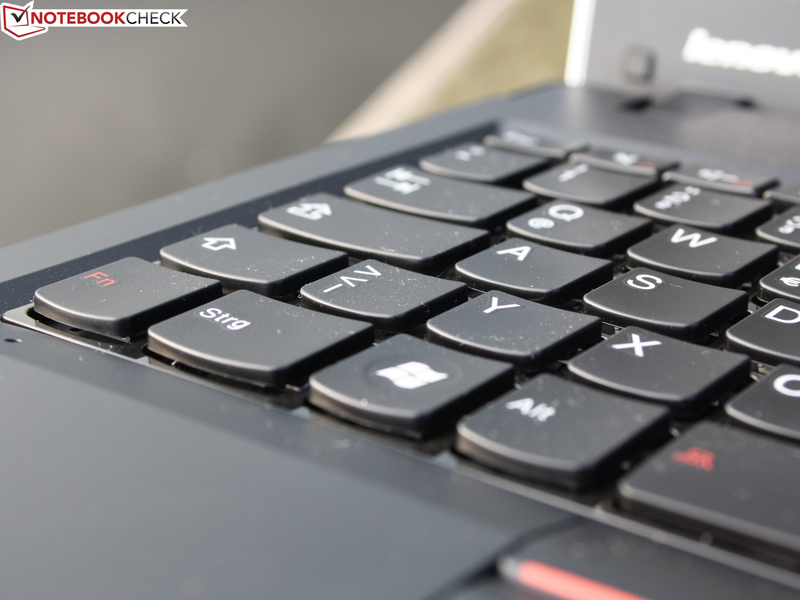 The keyboard supporting surface of the E320 does not lie firmly everywhere. From the left to the middle it provides the user with a firm end stop. On the right pressure with a finger can dent the surface a small distance. Those that use the keyboard with little or average strength won't notice this. The keys are relatively slippery (no rubber), but can be typed accurately thanks to the conical surface of the keys. Even the blind typers markings are clearly defined. 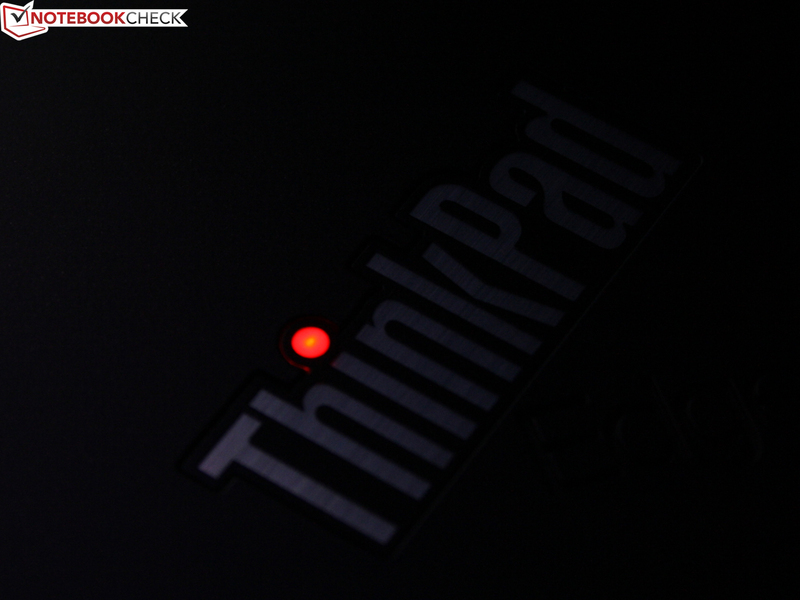 Depending on preference we were able to use either the conventional touchpad or the Trackpoint (Thinkpad UltraNav pointing device). The devices can be disabled independently in the mouse configuration. The two Trackpoint buttons sit under the space bar. The buttons have a very long travel, and a drawn out and clear pressure point. 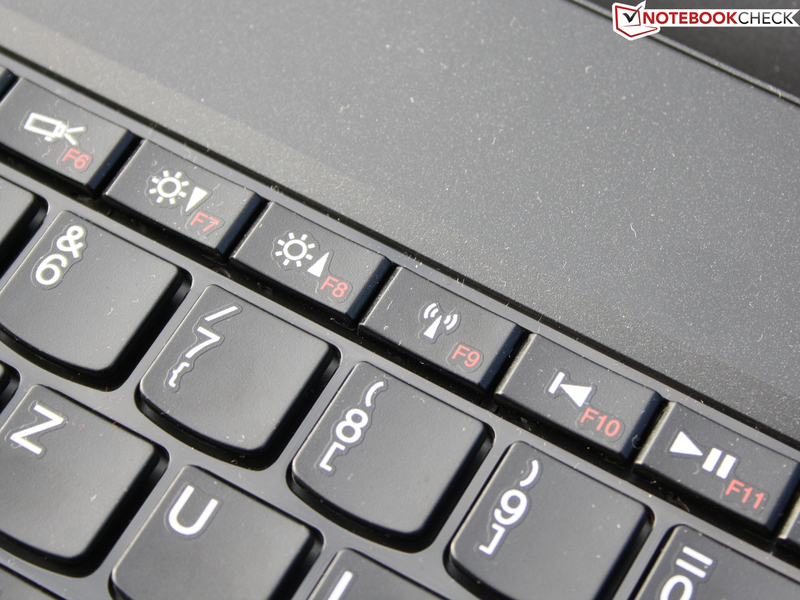 The touchpad (multi-touch gestures) doesn't have any buttons, since these are hidden beneath it. A left-click is performed by pressing the touchpad in the bottom left area of the touchpad. The strength required for this is relatively big, and can lead to tiring fingers. What is not satisfactory in our eyes is the short travel when pressing the touchpad. 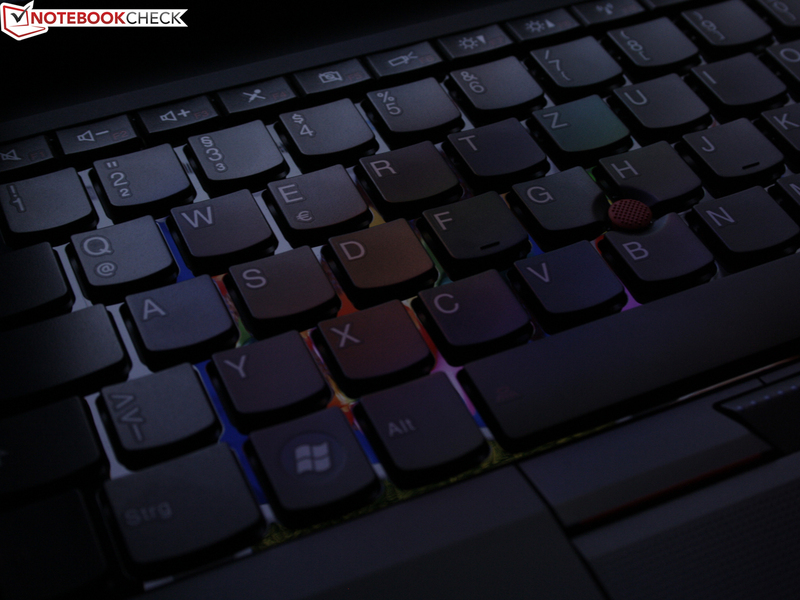 Compared to quick Trackpoint buttons, their use is not easy. 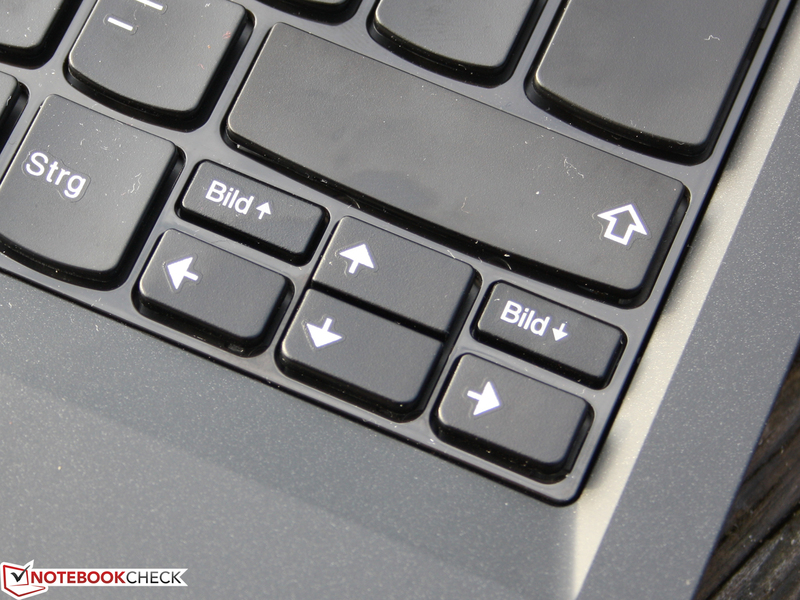 A right-click can be performed as usual by pressing the bottom right area of the touchpad. Controlling the mouse cursor is able to make a good impression overall. The low noise ambience, the swift operation (exception touchpad), and the grippy feel (small bumps) are appealing. 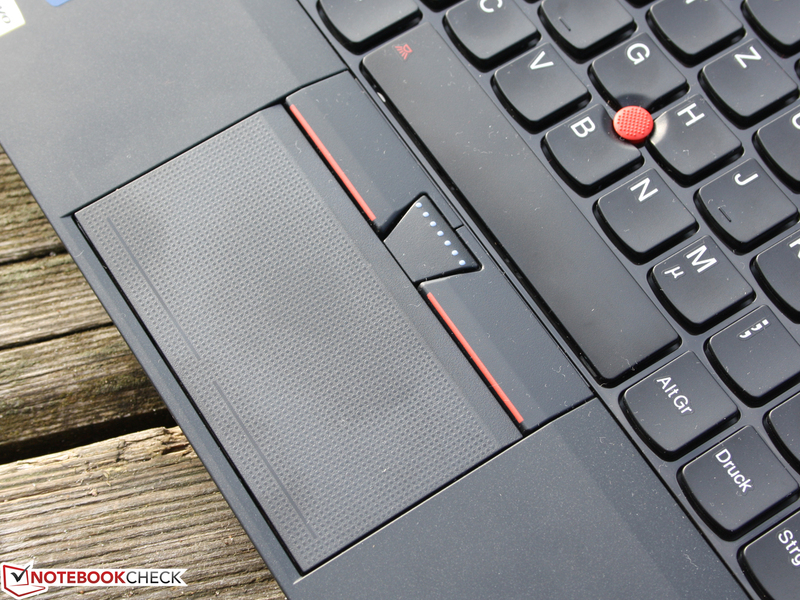 Due to the omission of the lower buttons, Lenovo is able to build a touchpad with a diagonal length of 10.5 centimeters into the 13.3 inch subnotebook. The non-reflective AUO display panel (type: B133XW03-V1) wasn't able to impress us. The resolution of the 16:9 display is standard for the 13.3 inch form factor with 1366 x 768 pixels. The weak contrast of 189:1 unfortunately as well. Colors are not vibrant, and blacks have a grey tint. The matte surface of the display is not the reason for the weak contrast level. A glare type display would optically enhance the colors by making them more brilliant, but the black level (0.93 cd/m²) would stay the same. 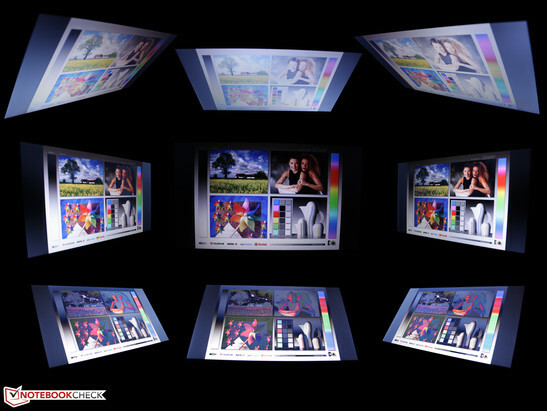 The color space of the AUO display panel is significantly below sRGB (middle picture), which means that it cannot fully represent the colors in the spectrum. The color space is however only relevant for professional image editing, which is why only expensive exceptional 13.3 inch subnotebooks are better in this respect (Samsung 900X3A, Vaio Z13Z9E). Even the often praised IPS display panel (very good viewing angles) in the ThinkPad X220 only has a marginally bigger color space, and doesn't cover sRGB. The non-reflective display panel unfortunately only offers a low brightness. On average we measured 173 cd/m², but only with the power cable attached. The maximum our testing device measured was a brightness of 184 cd/m², in the top left corner. 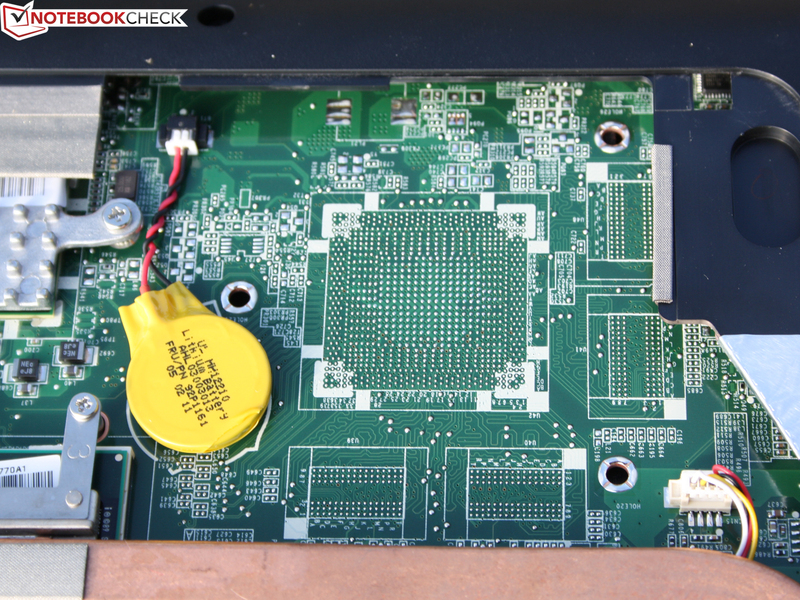 As soon as the power cable is removed, the E320 dims the brightness down to 165 cd/m² (middle measurement). In light of the intended outdoor use scenario, a consistent luminance in excess of 230 cd/m² would be preferable. In this case sunshine lovers will however have to glance at a dark display with or without an attached power cable, since the rays of sunshine trump the low background light. Last but not least come the viewing angles. It shouldn't come as a surprise that the viewing angles are very narrow, when considering the aforementioned weak characteristics of the AUO display panel. Only at up to about 45 degrees of horizontal deviation from the center were we able to clearly recognize colors without any inversion effects. When deviation above or below (vertically), the displayed text remains clearly legible up to about 50 degrees. The brightness however already reduces from about 20 degrees, and colors change to the point that they can no longer be properly recognized. 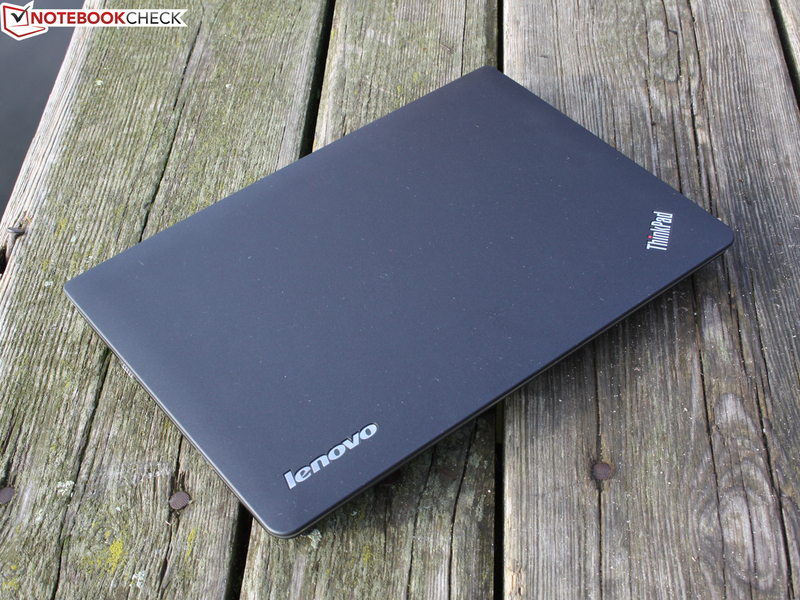 Lenovo's 13.3 inch subnotebook is equipped with an Intel Core i3-2310M (2x 2.1 GHz). The dual-core CPU does not support Turbo-Boost, but does support Hyper-Threading (4 threads processing). The TDP of the CPU lies at 35 Watts. Of this the two cores require 25 Watts. 10 Watts are used by the integrated Intel HD 3000 graphics solution, and the internal DDR3 memory controller. Under load the power consumption of the components can however increase beyond these values though. There are 4096 MB of DDR3 RAM on board, whereby only one of the two available sockets is occupied (1x 4096 MB). The hard drive is made by Hitachi (HTS723232A7A364), and has a capacity of 320 GB, with a rotational speed of 7200 rpm. Those that want to buy a ThinkPad Edge will have to decide whether the AMD Fusion or the reviewed Intel version should be acquired. The advantage of Fusion: The Edge E325 is already available from 420 Euros. Is the Sandy Bridge i3 processor so much faster that the additional cost is justified? The i3 2310M manages to score more than twice as many points (3446) in the single-core processing Cinebench R10 single 64-bit benchmark with its 2.1 GHz than the AMD E-350 APU with 1.6 GHz (1125). The bigger CPU brother i5-2520M (2.3 GHz) manages to score even more points at 5050 (64-bit) thanks to Turbo-Boost. When it comes to daily use multi-threading is however more relevant than the single-core load (Cinebench R10 multi 64-bit). The i3-2310M manages to score 7398 points in this discipline. The E-350 is about 70% slower with 2200 points. It would be unfair to the AMD Fusion option to just leave things with the significantly higher processing performance of the Intel CPU. The Fusion APU is first and foremost a relatively powerful graphics card with an additional CPU. When utilizing the graphics performance of the HD 6310, the system performance of the Fusion system could be able to keep up with the Intel version. Or perhaps not? We examined this with system benchmark, which tests the performance of the HDD, the RAM, and the GPU hardware support etc. The PCMark Vantage benchmark determined a score of 5457 points. 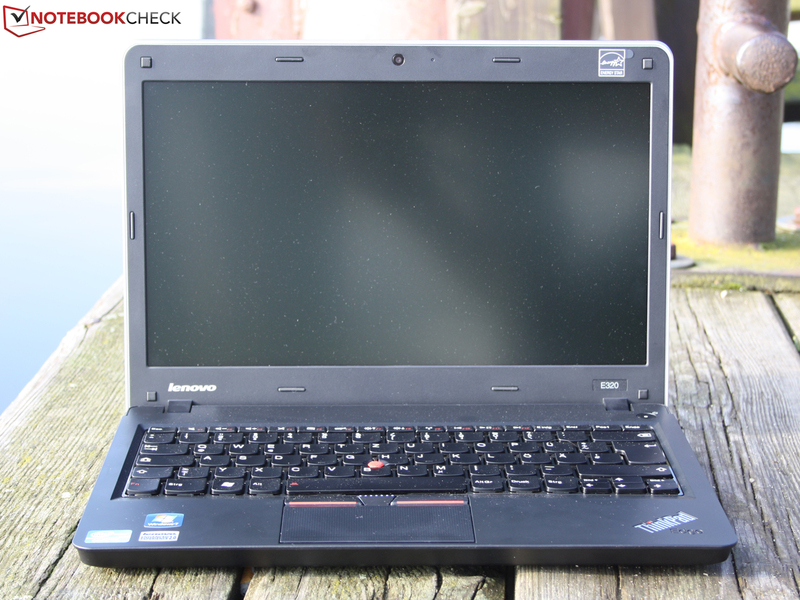 The E-350 system with AMD only managed to score 2600 points (ThinkPad X120e). The AMD predecessor Edge 13 (K685) at least managed to score 3753 points. The PCMark 7 benchmark was completed by the E320 with 2009 points. 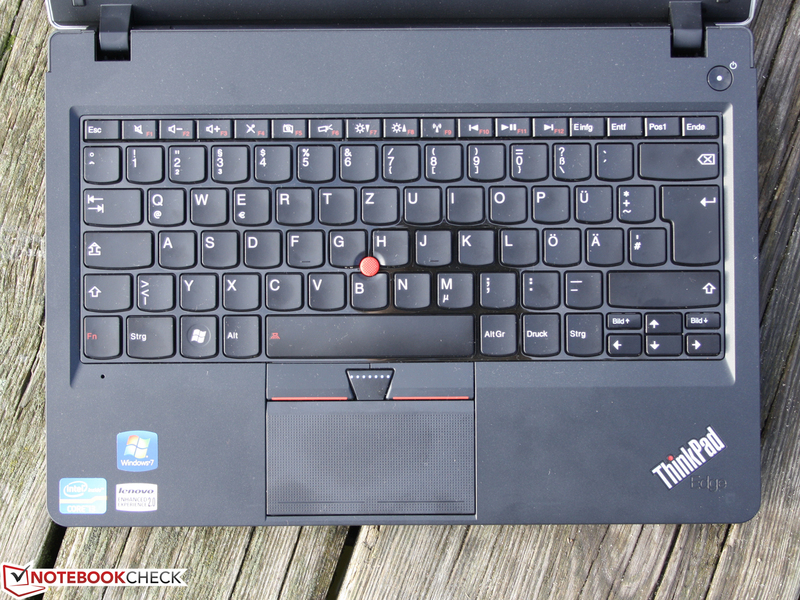 The 1101 points scored by a Fusion E-350 system (ThinkPad X120e) lag far behind. What stands out is that 'big' notebooks with an i5-2520M (Turbo-Boost) score between 5800 and 7700 points, and 2100 and 2300 points, using PCMark Vantage and PCMark 7, respectively. 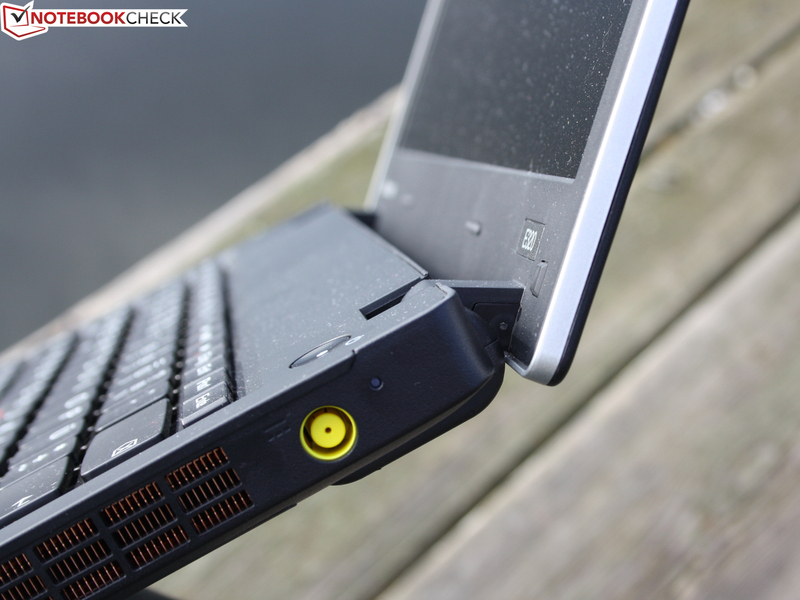 The small Edge E320 thus provides a normal notebook performance, and not a scaled down subnotebook performance. Summary: According to the system benchmarks the E320 is significantly faster (53% and 45%; PCMark Vantage and PCMark 7) than a Fusion E-350 system. What will be noticeable by users are the longer copy and installation times. When simultaneously carrying out several installations and copy tasks, the Fusion APU reacts acceptably quickly. However, the performance crown is clearly won by the i3-2310M in this case. Thanks to a fast hard drive the Fusion system is only able to make up for this to a small extent. The 3DMark2006 benchmark, for determining the gaming suitability, measured 3098 points. The 2010 Intel HD generation (also CPU integrated) on average only manages to score 1500 points (depending on CPU +/- 200 points). Gaming is possible within limits with the Intel HD 3000. The dedicated entry level GPU Radeon HD 6470M is only 3% faster (3DMark2006), whereby the driver is however better adapted to the games. The Radeon HD 6310 is clearly defeated by the HD Graphics 3000 in the E320 with 1980 points (3DMark2006). This would make the HD 3000 appear to have an exaggerated advantage though, since the pure processing performance of the HD 6310 and Intel GPU is more or less equal: The OpenGL test in Cinebench R11.5 shows the pure shader performance: HD 6310 8.09 points; HD 3000 7.3 points. When it comes the mass storage device Lenovo has opted for a Hitachi hard drive with a capacity of 320 GB. The HD-Tune and Crystal Disk Mark 3.0 benchmarks results for the 7200 rpm HDD are above average, which is confirmed by the PCMark Vantage HDD score of 4148. The throughput during sequential reading lies at 79 MB/s. Crystal Disk Mark measures a more comprehensive result including the throughput when reading/writing small and large data packets (click tab). What stands out are the small numbers determined for reading and writing scattered 4K packets (0.4 / 0.8 MB/s). This slow result is typical for rotating HDDs, since the read/write heads have to mechanically reach a position. 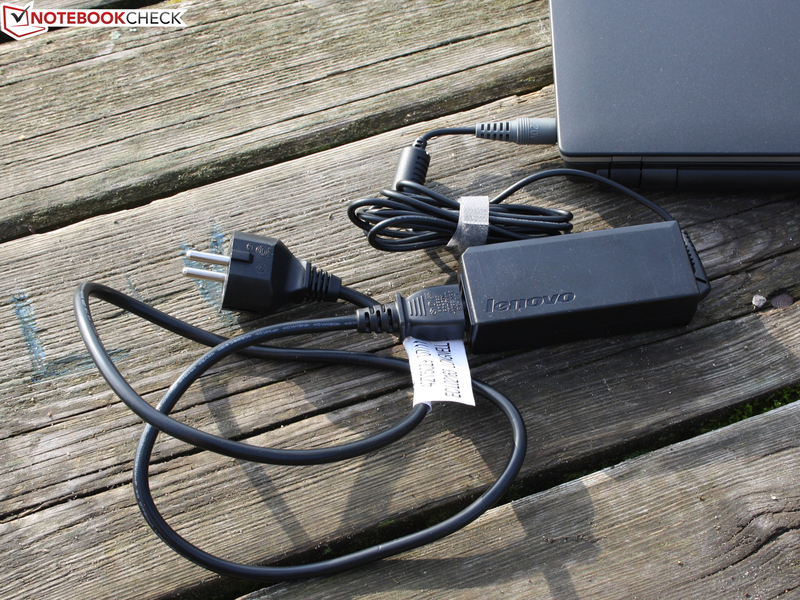 This can only be improved with an SSD, which is provided by Lenovo's SSD version (128 GB; 685D090). For gaming the Intel HD Graphics 3000 is only suitable with a lot of compromises. But occasional gamers are still better served with the DirectX-10.1 IGP in most cases than with the HD 6310 in an AMD Fusion system (Edge E325 alternative). Trackmania Nations Forever can be played on the E320 smoothly with 36.6 fps with the details set to high. Even an HD 6470M (Dell Vostro 3350) doesn't achieve significantly more frames with 45 fps. The HD 6310 was 34% slower than the HD 3000 in numerous test games, which is primarily due to the bottleneck imposed by the slower Fusion CPU, the same way as with the IdeaPad S205. Older games (Left4Dead) sometimes run smoothly with high detail settings. With current less demanding games, such as Fifa 11, medium detail settings have to be selected with a Core i3. See the article Intel HD Graphics 3000 graphics solution and the details for the IGP. Without a lot of utilization, such as when surfing the web or working with Outlook, the system noise remains between 31.5 and 34.6 dB(A). The noise emitted by the fast turning HDD is quieter than the noise of the permanently running cooling fan. Due to this its noise is only measurable when the read/write heads quietly click (31.7 dB(A), no disturbing vibrations). During a constant maximum load for the processor, and the integrated HD 3000, the cooling fan quickly becomes considerably louder with 39.7 dB(A). The cooling system shows itself to react quickly, since a mere 20 seconds following the cessation of the load the noise level scales down to 34 dB(A). A 3DMark2006 benchmark, which primarily utilizes the GPU but also the CPU, makes the cooling fan emit a noticeable but acceptable noise level of 35.8 dB(A). This is the maximum noise level users should expect during normal use. Stress test with Prime95 (CPU) and Furmark (GPU): Even after several hours there was no throttling (reduced clock speed) of the CPU. The temperature behaves the same way as the system noise. In an idle state it is hardly noticed, but under load tolerable. 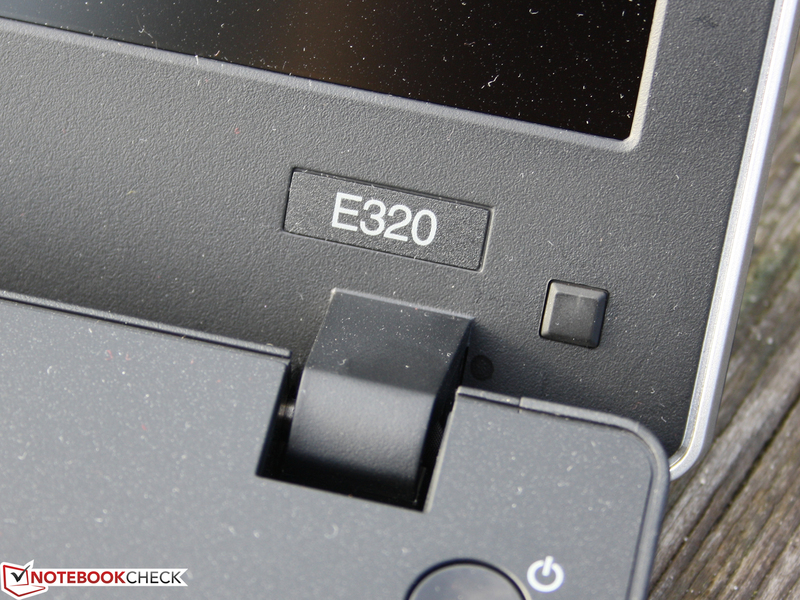 In an idle state and during office use, a likely typical scenario for the E320, individual areas merely become lukewarm (30 degrees top surface). The bottom heats up to a maximum of 35 degrees in some places. The peaks in heat emission during the stress test are obviously higher with 40 (top) and 46 degrees Celsius (bottom). The palm resting area remains lukewarm at all times though, and we measured a maximum of 32 degrees. CoreTemp determined a buffer of 5 degrees to Tjunction (clock speed @2.095 MHz) on the processor during the several hour stress test. During the several hour stress test (Prime95 + Furmark, see screen) there was no throttling (clock speed 2x 2.1 GHz). Turbo-Boost may not be relevant for the i3, but we nevertheless had thermal throttling with the Samsung 200B5B using the same CPU. We can confirm that the clock speed stays constant at 2.1 GHz (@Samsung 1.5 GHz throttle) under load in the E320. In addition to this the stress power consumption of 47 Watts was also constant (Prime95 solo: 38W, Furmark solo 33W). (±) The average temperature for the upper side under maximal load is 35.2 °C / 95 F, compared to the average of 30.7 °C / 87 F for the devices in the class Subnotebook. Where can the speakers be found? Visually there are no openings. We discovered these in the recess of the hinges though. This unusual location unfortunately doesn't provide for a good acoustic. The contrary is the case. The sound is high pitched, with little bass, and sounds thin. For the listenable playing of music we would definitely recommend the use of external speakers, or qualitative headphones. 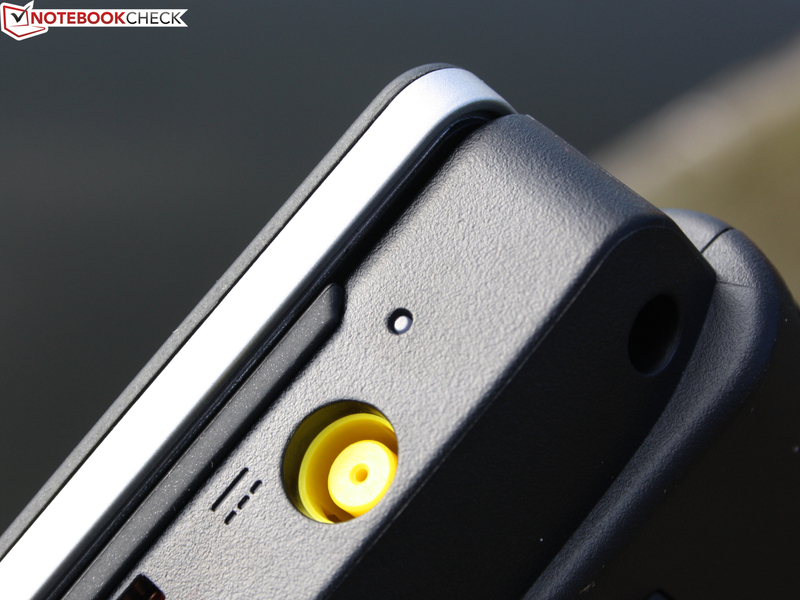 The 3.5 mm jack socket for headphones is combined with that for a microphone. The power consumption of the Edge E320 shows a large gap between an idle state and high load (CPU+IGP). This is typical for Intel Core processors. 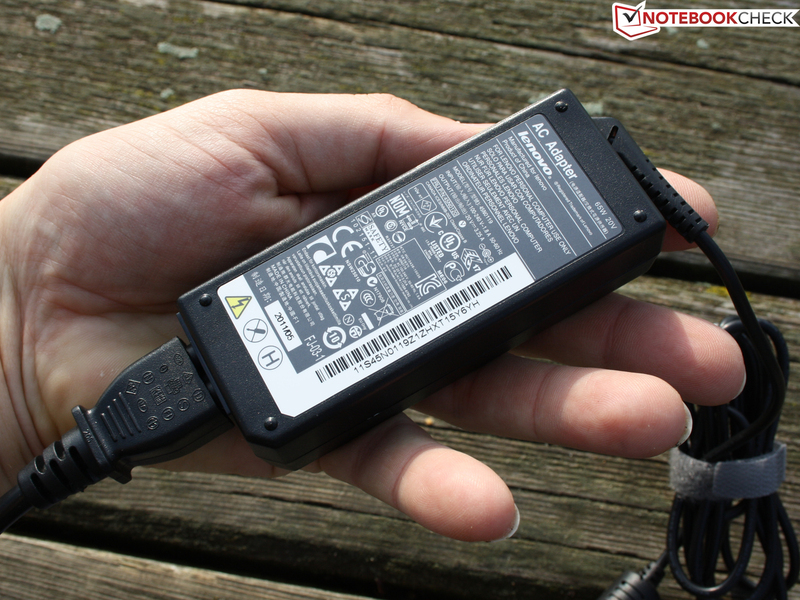 The Idle power consumption of the Edge lies between 8.8 Watts (power saving, lowest brightness) and 13 Watts (maximum performance, maximum brightness). Stress is the opposite. The 3DMark2006 benchmark (IGP Intel HD 3000) requires 32 Watts. During the stress test the Core i3 is added to this and we measured 47 Watts. The small 65 Watt AC adapter (227 grams) is suitable for this power consumption, and can simultaneously even charge the battery. A battery life of up to seven hours many not be the best for the subnotebook class, but is nevertheless considerably good considering the standard Core i3 processor. 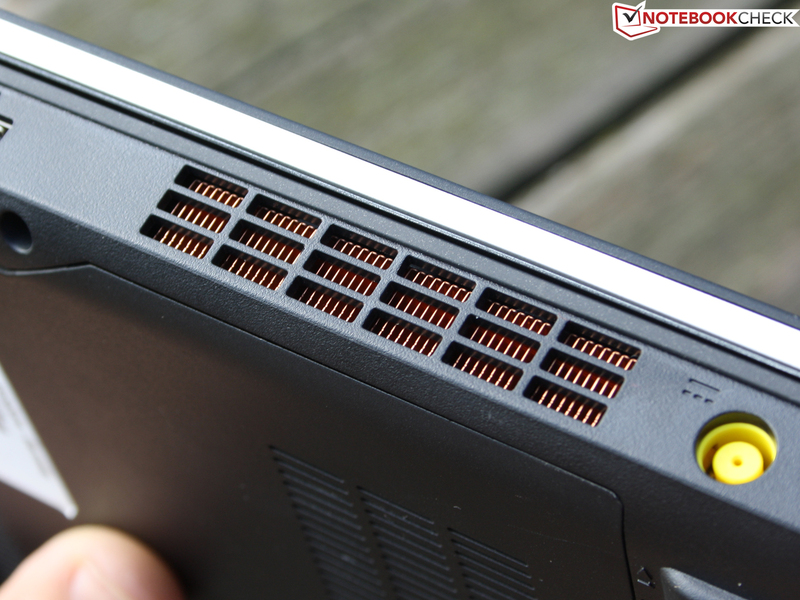 The battery has a normal capacity of 63 Wh, and doesn't protrude, as in the ThinkPad Edge 13. The WLAN test (surfing the web) ends after 6:58 hours, and a load test in comparison only lasts for 2:17 hours. The brightness of the TFT was set to 100 cd/m² for the WLAN test. Disadvantage: The charging time of 3:02 hours is relatively long. The previously tested Edge 13 with AMD lasted for 5:31 hours in the WLAN test, hence nearly 1:30 hours less (also 63 Wh). 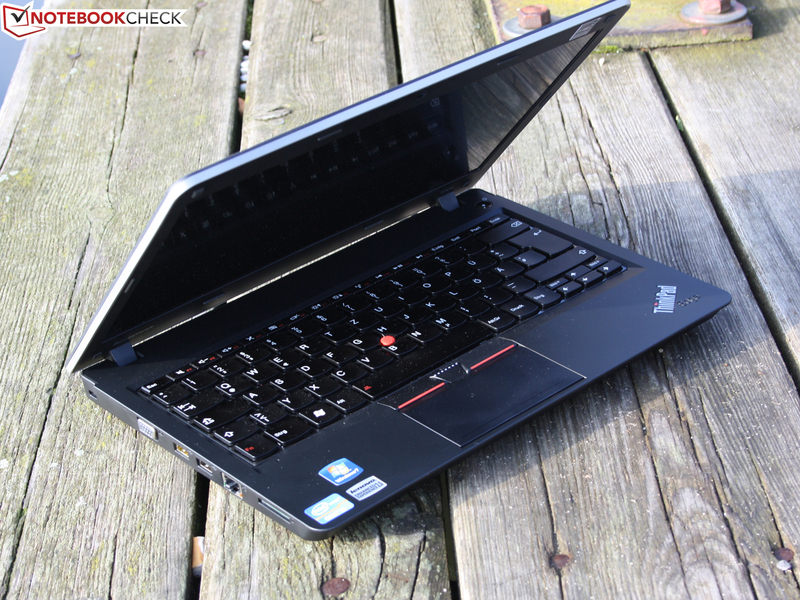 Lenovo's ThinkPad Edge E320 (NWY3RGE) is a simple but interesting 13.3 inch subnotebook. Precisely due to the fact that there is no 'weak' low-voltage processor from Intel, but instead a 35 Watt standard CPU, it has significantly better performance than the previous AMD option in the Edge 13 (K645), and the Fusion option in the brand new Edge E325 (currently in for review). Together with a fast hard drive the application performance is very good for a subnotebook. The battery life doesn't suffer as a result of the standard processor with seven hours (WLAN test). With a constant high load it could get warm under the fingers though. The mobile internet is always available with the integrated HSDPA module, provided that an appropriate data contract is available. Technologically the manufacturer has done everything right so far, with the exception of the weak backlight of the matte display. 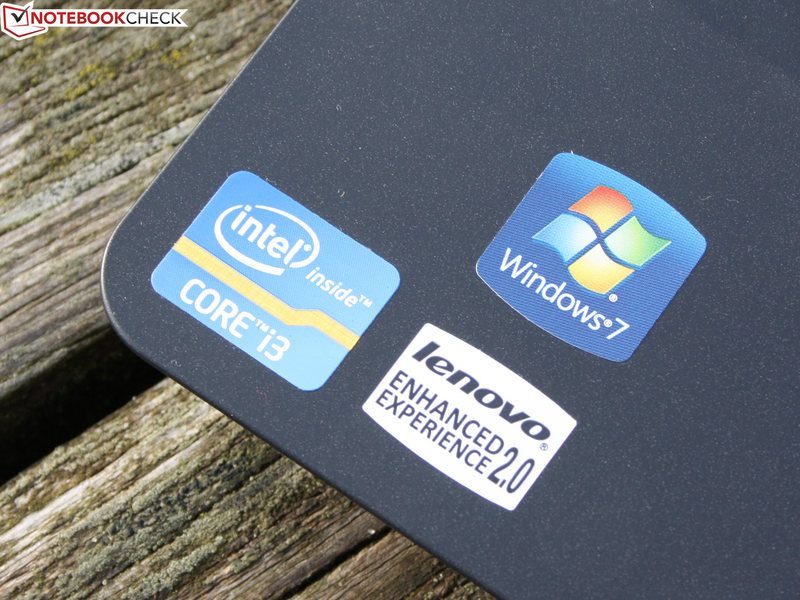 Unfortunately Lenovo hasn't done anyone any favors with the selection of the chassis. The input devices may be good to very good as usual, but the chassis and the hinges have compromised their unquestionable reputation. 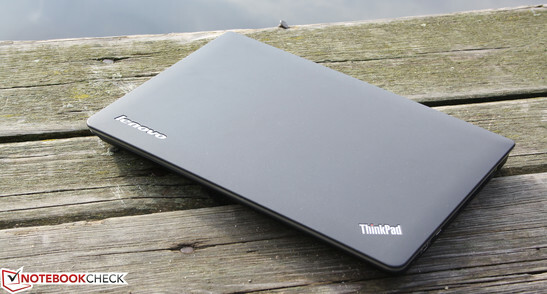 The case can be noticeably bent, and the soft and thin plastic hinges make fun of the ThinkPad name. Those that can look past the consumer chassis will receive a fast and mobile subnotebook with the E320 for daily private or business use. The sister model E325 is not an alternative due to the identical chassis. Especially not for those that want to buy proper notebook performance. 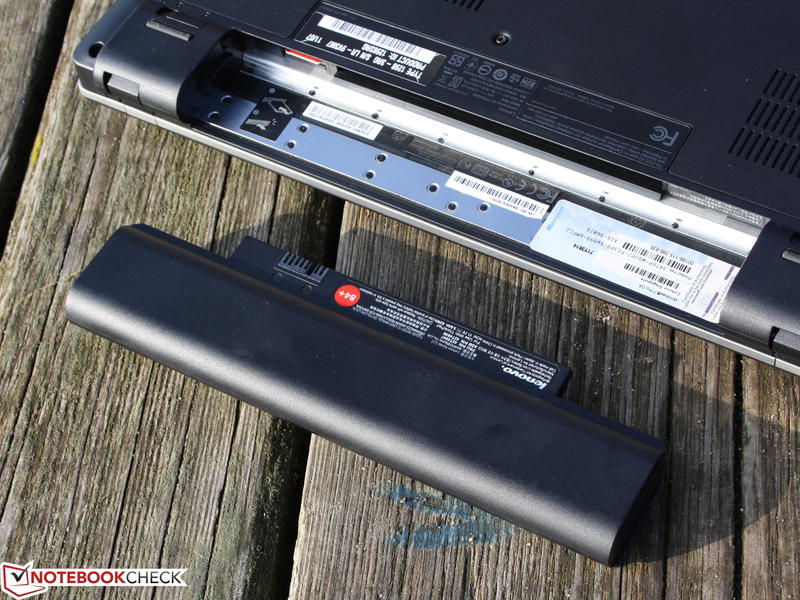 The AMD Fusion fitted Edge notebooks score when it comes to battery life and price. Their performance is generally only sufficient for web and video entertainment though. 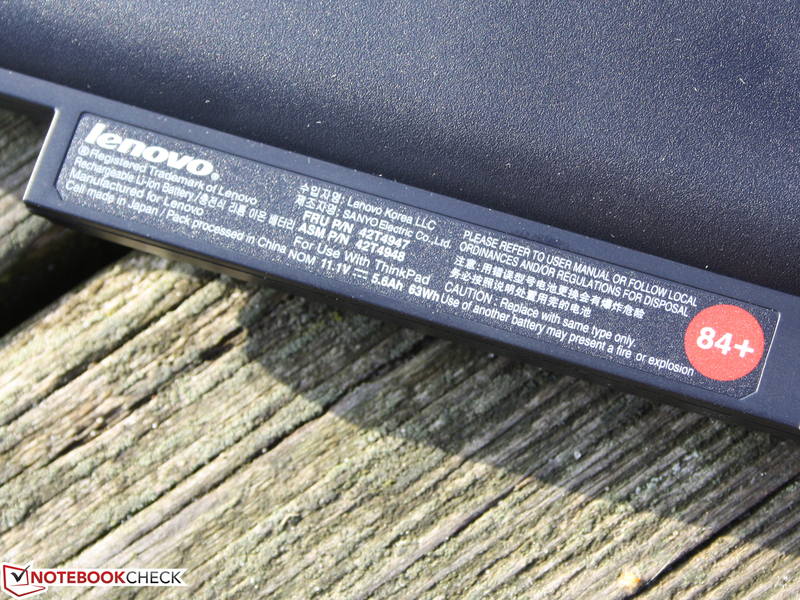 Lenovo ThinkPad Edge E320 NWY3RGE: A step forward for battery life, but a step back for the stability of the case. 13.3 inch subnotebooks are available in abundance. The touchpad is now a ClickPad, hence the surface is pressed. which is sufficient for the maximum power consumption of 47 Watts (stress test). Beneath the aluminum base plate we have access to the replaceable components. The 2.5 inch HDD can be swapped for an SSD. The 3G module from Ericsson supports all the latest standards (WCDMA/HSPA/GSM/GPRS/EDGE/A-GPS). There is room for another 4 GB RAM module. The CPU is plugged and could be replaced by a Core i5-2410M. An empty solder socket, probably for a graphics card. 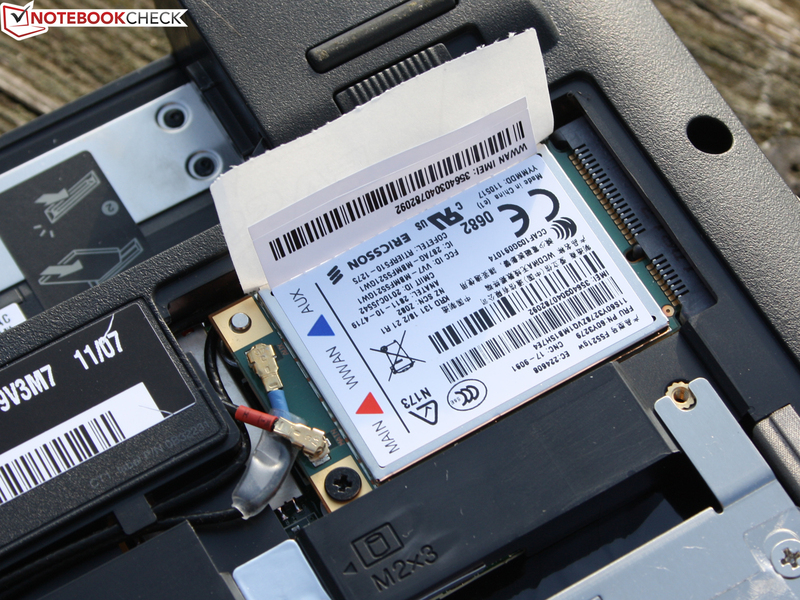 Under the battery the SIM card can be inserted (HSDPA module integrated). and has a capacity of 63 Watt-hours. The keys have a conical surface. The dentable glossy mesh and right side of the keyboard are an obvious sign of consumer price class. But with a ThinkPad brand? Not everyone has that. You can let yourself be seen using this at the university, with friends, or with colleagues. 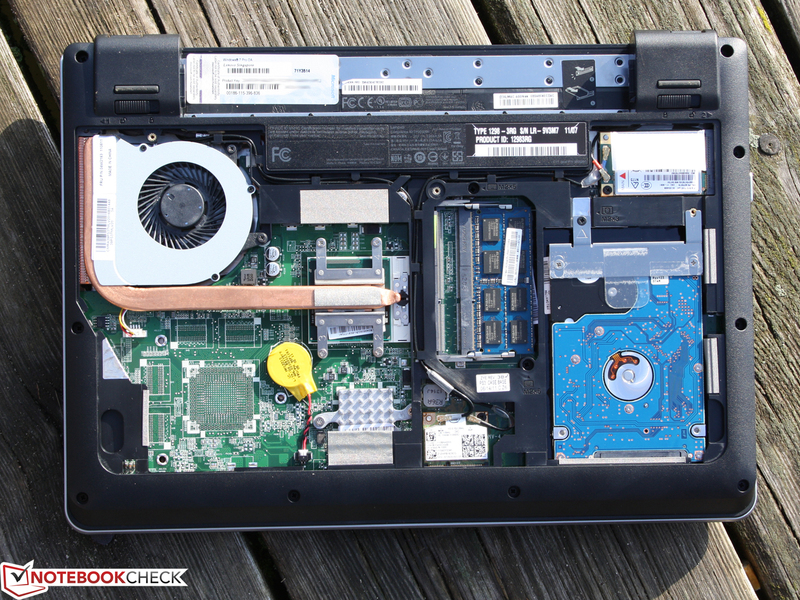 With the Core i3-2310M a standard laptop processor is at work in the E320. Together with the matte WXGA display a good mobile usability should be expected. The not especially bright display dims this prospect though, and the desktop often remains dark. The manufacturing quality is unfortunately worse compared to the previous Edge 13. The chassis can easily be bent with two hands. The hinges are softly attached, and let the display wobble. The subnotebook has an eSATA port, but no USB 3.0.
as well as for the battery charge (next to power input). 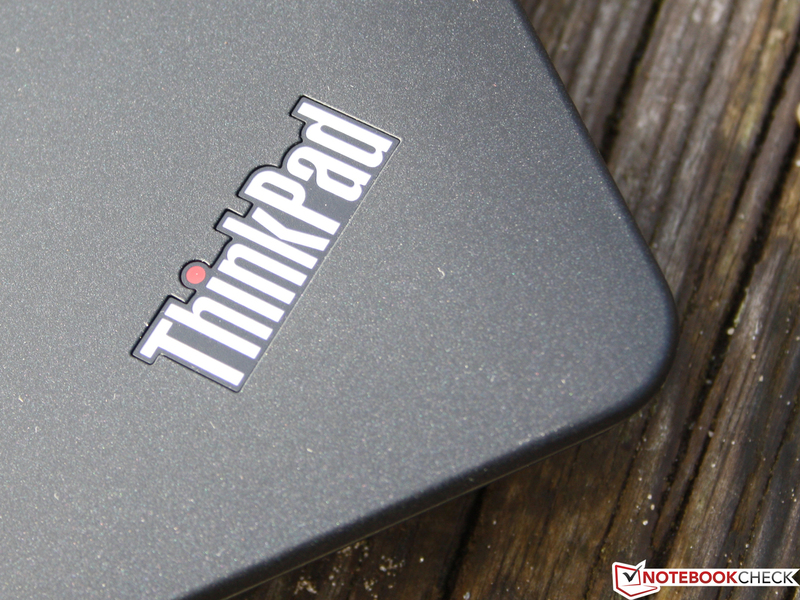 The input devices have a similarly good feedback as the larger ThinkPads. Accessories: No recovery media for Windows 7 Professional 64-bit included. eSATA port in a 13.3 inch subnotebook. Accurate keys with a crisp pressure point. The firm case of an Edge 13. A bright display for nice summer days on the balcony. The buttons for the touchpad disappear and are replaced by a ClickPad. Seven hours of battery life in a realistic surfing scenario, and not even a low-voltage CPU. Affordable business: Edge 13 (AMD), Edge E325 (Fusion); Lenovo X121e: Fusion or low-voltage i3-2357M; HP ProBook 5320m; HP Pavilion dm4-1301sg; Dell Vostro 3350: HD 6470M from 960 Euros; Dell Vostro V130: Luxury aluminum. Expensive business: Toshiba Portege R830-10V: 256GB SSD; Sony Vaio VPC-Z21V9E/B: External Radeon HD 6650M; Sony Vaio VPC-SB1A9E/B: HD 6650 (option); Lenovo ThinkPad X1: SSD; Thinkpad X220 with exciting IPS display; Fujitsu Lifebook S761: SSD; Dell Latitude E6220.